Signs of spring are popping up everywhere in the SouthEast! Early wild pears are blooming, the peach trees are beginning to leaf out, and my hands are now perpetually dirty! I Love IT! As I scrambled my eggs this morning with the Dandilion leaves left over from my root digging session, I decided that with new growth popping up all around me it was time to do a weed walk. Though I wish I had a video camera, pictures from the farm are going to have to do. This list is by far not a complete over veiw of the wild goodness availible in Georgia this time of the year, simply a couple of my favorites along with various poisonous look alikes to stay away from, Now come along and walk with me on the farm…Its a great day outside! The Notorious Dandilion! We all know it, some of us like it, some of us hate it, but we all have to admit we've made a wish on the seed heads a time or two! Though its been talked up and down in various other "weed eater"(Lol;) Blogs, I had to include it because the picture just makes me smile! All parts of this wonderful plant are edible. Its leaves are great stir fried, steamed, scrambled with eggs and any other way you could eat spinach. The blossoms make great additions to salad and some like them fried though I've not tried them that way yet. The Root is the real powerhouse, being a liver tonic, blood cleanser, iron builder and all around spring do-gooder. Try it chopped like carrots and steamed (with Butter! ), sliced into a savory warming soup for the chilly spring nights, or dry it and grind it for a coffe substitute. (Done in this manner, I usually mix mine in my coffe for a slight chicory like flavor. I still have yet to experiment with Dandilion Wine! This Delicious weed is also great any way you would fix spinach. I like it in an oriental style stir fry! 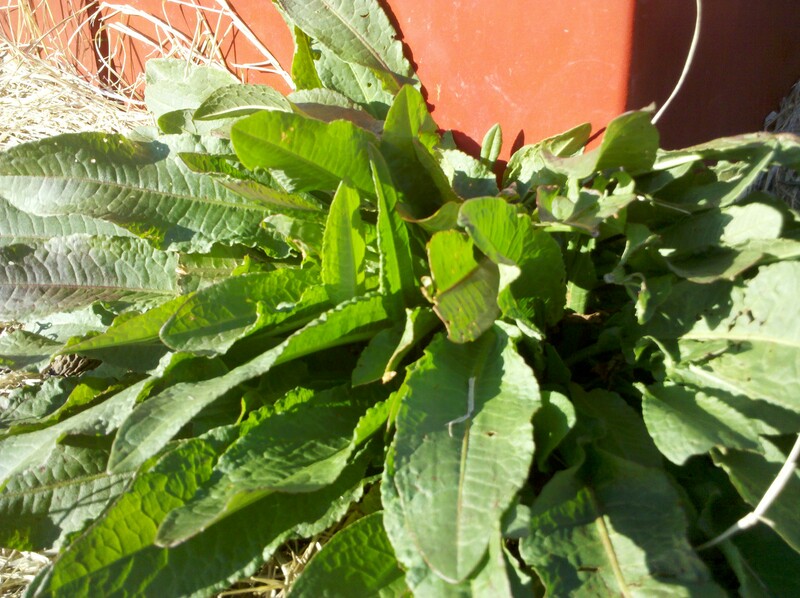 The health Benefits of Yellow Dock are very similar to dandilion and combined create the best spring cleansing tonic out available. Be careful, though, the roots effects could be slightly laxitive as well as diuretic(i.e. makes you pee alot:), but thats just part of the cleansing effects. The middle section of the yellow dock leaf can be bitter, which is very good for it's digestive effects, but I just can't bring myself to 'like' the bitter flavor. 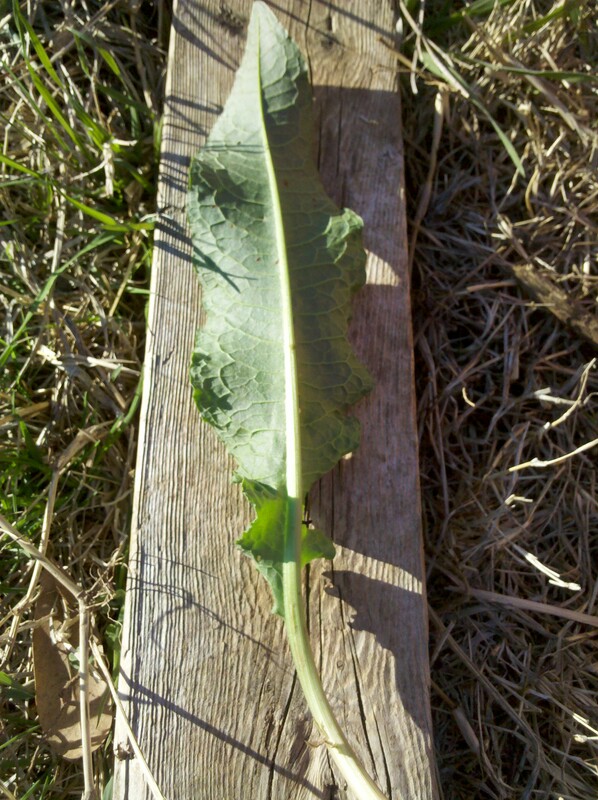 To solve this problem, I just cut the middle out before I cook the leaves. You can munch on a few middle pieces before a particularly heavy meal to prevent indigestion! This wild onion is absolutely unique in taste, like a cross between a sweet onion and garlic all wrapped up and concentrated in a quarter sized bulb. The flavor is so strong it usually only takes one bulb to flavor an entire dish. The curly tops (a great way to identify them) are like chives and can be used in all the ways chives can, my grandmother likes to dry them and munch them for a viamin packed snack! I have had great success with treating colds and weak flu like symptoms by cooking chicken noodle soup with about three bulbs of wild onion, so Im assuming it probably has at least some of the antibacterial and infection fighting properties of garlic along with all of the micro-nutrients wild species can provide. 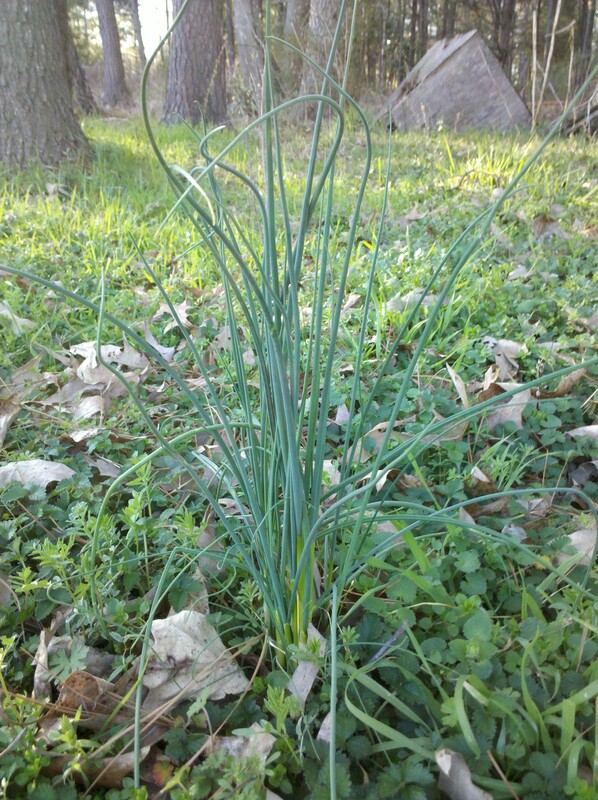 Dont Confuse this plant with wild onion or garlic, It is Poisonous! This is a daffodil, or narcissus, and can sometimes be found in the same areas as wild onion. 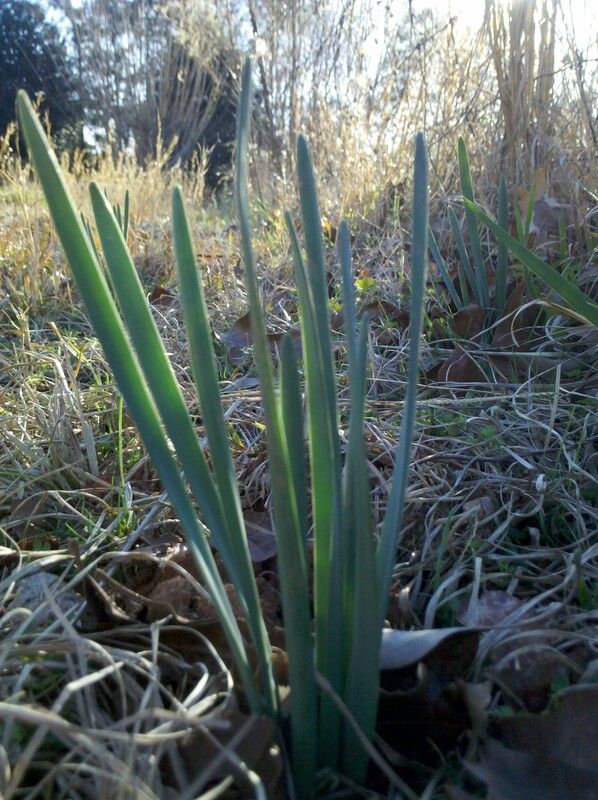 Wild onion usually has more slender, rounded leaves and either curly or very pointy tips. The Daffodil has flatter, more blue tinted leaves and is only edible to squirrels or chipmunks. 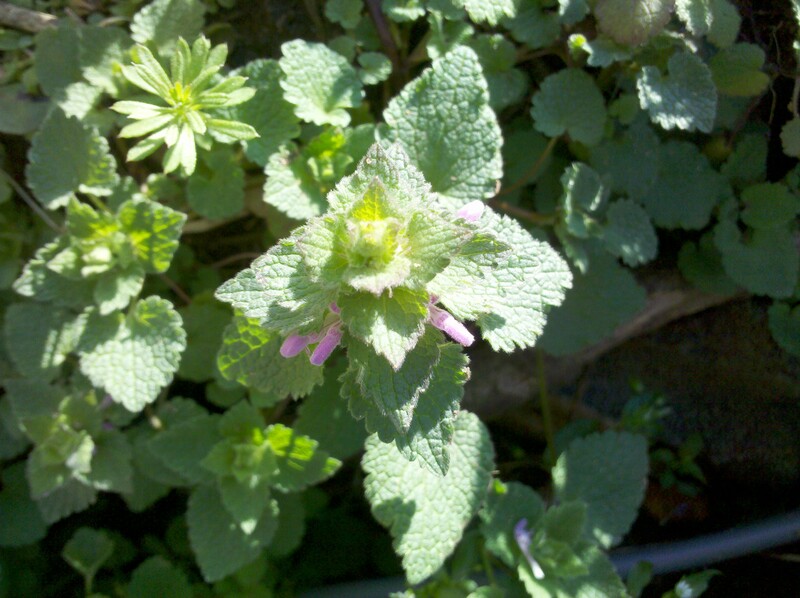 Henbit is a great little pot-herb full of micro nutrients, a relative to mint. Toss some in that Dandilion root and wild onion soup! One great way to identify Henbit is by its beautiful purple tinged tops and it's suqare shaped stem. It's leaves are also kind of fuzzy and soft. 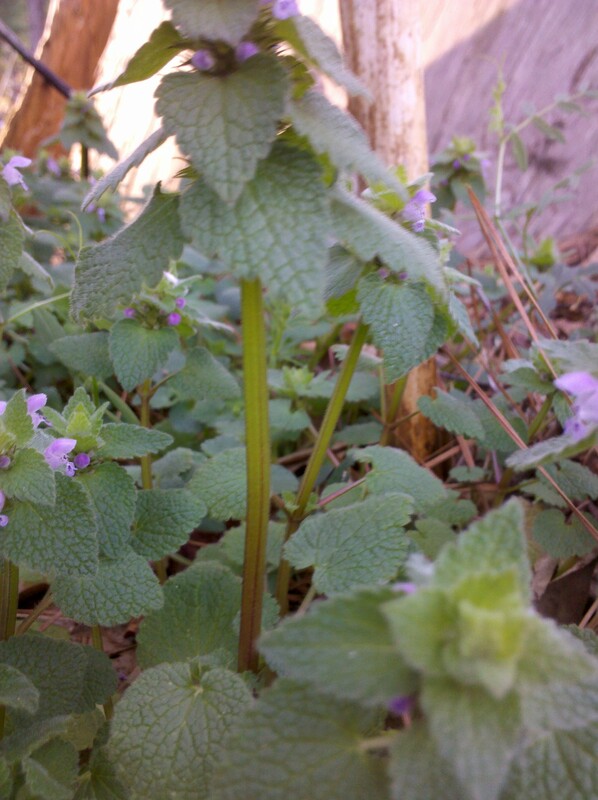 The square shaped stem is common in all of the mint family. 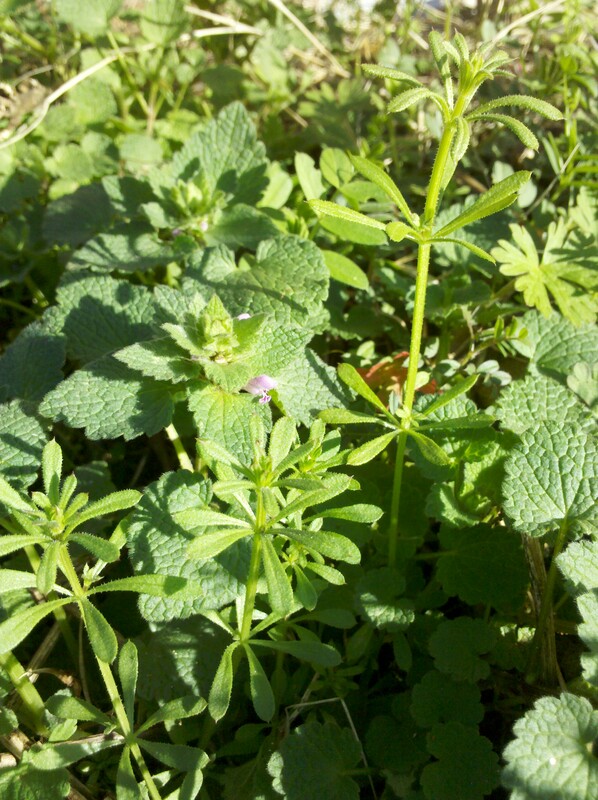 Cleavers is a wonderful little herb that loves to hang around henbit. 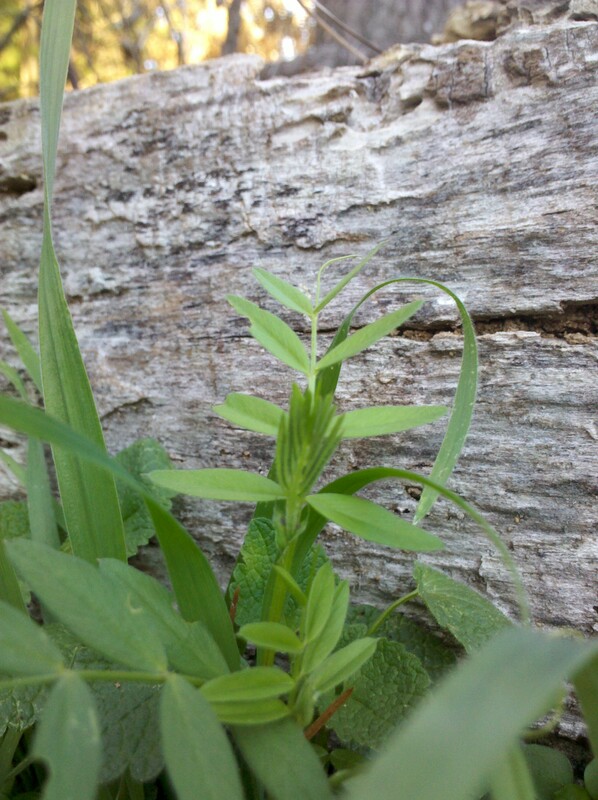 You can identify cleavers by the seven or so leaflets emerging from a very long and creeping stem. You can also see the tiny, very sticky hairs all over the whole plant. Cook or Dry the plant before using because the sticky hairs can irritate your throat, Believe me, I know from experience;)! 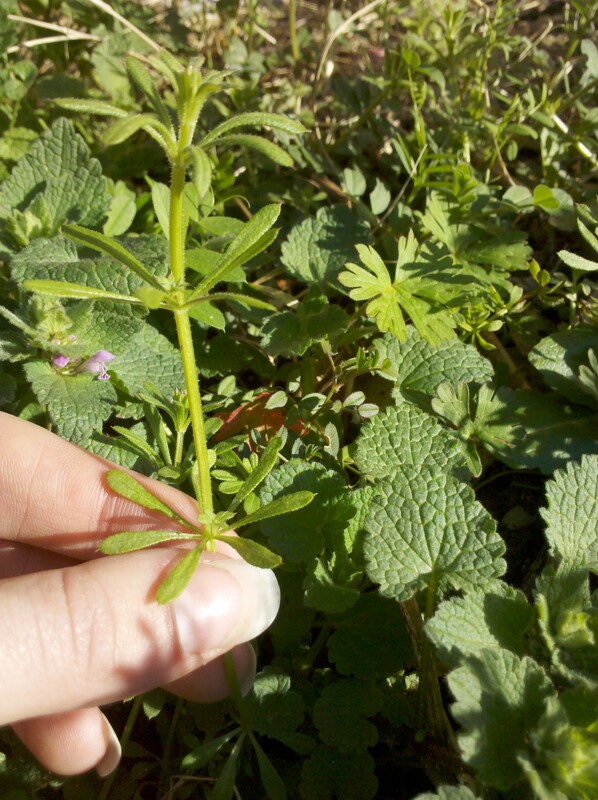 Don't confuse cleavers with this very Un-Edible weed, from the wild pea family. From a distance it can look similar, but it is not sticky at all and the leaflets occur opposite each other on the stem instead of in a circular pattern. It also likes to hang out with cleavers, so be careful. Dont try to eat anything wild from the pea or bean family, they are notorious for being poisonous! Fresh or dried cleavers are alterative, anti-inflammatory, astringent, diaphoretic, diuretic, tonic and vulnerary. It is also very cleansing to the entire body which makes it useful for treating cancer patients or those with a buildup of toxins. This plant was called white man's footprint because it has spread everywhere the European explorers travelled. Besides being edible, it is also very useful for treating wounds, spider bites and to draw out a splinter. The most effective application is a poultice created by chewing a leaf or two and applying directly to the shallow cut, scratch, or bite. I succesfully treated my cat in this manner after I walked in to find a very large black widow spider hanging from it's paw! 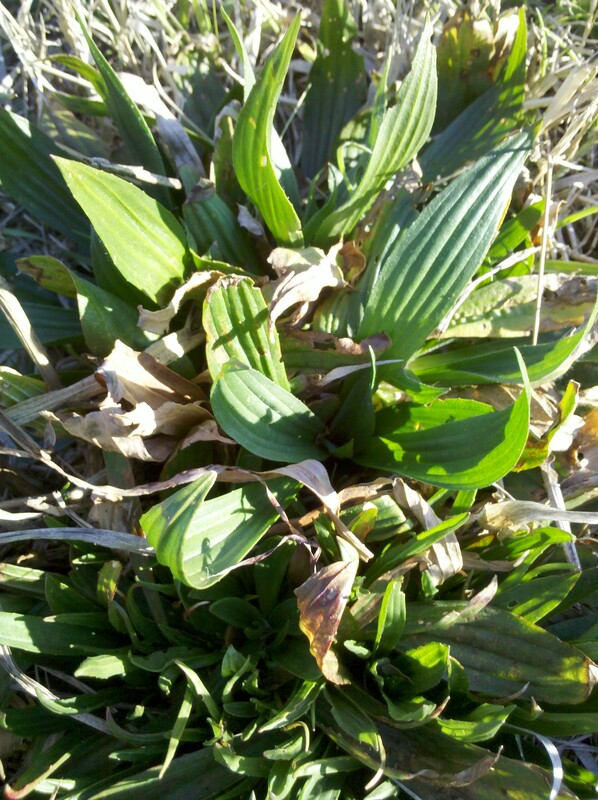 You can properly identify plantain by the very pronaounced ribs on it's leaves and very dark green color. This is the lance leafed variety but there is also a wide leaf variety that has'nt made an appearence yet. Though it is edible and very nutritious, I would only save this for a life or death survival experience because the leaves are more stringy than celery! As I said before, this is but a hint of the availible bounty in your lawn! As more plants peek their dainty heads out of the soil and the seasons begin to change creating all the transformations spring brings, we will continue to document wild plants and their uses, along with uses of the different parts like root, flower and seed that havent been covered today. Who knows, maybe I’ll find a video camera and we’ll go on a real weed walk! Wonderful blog post! 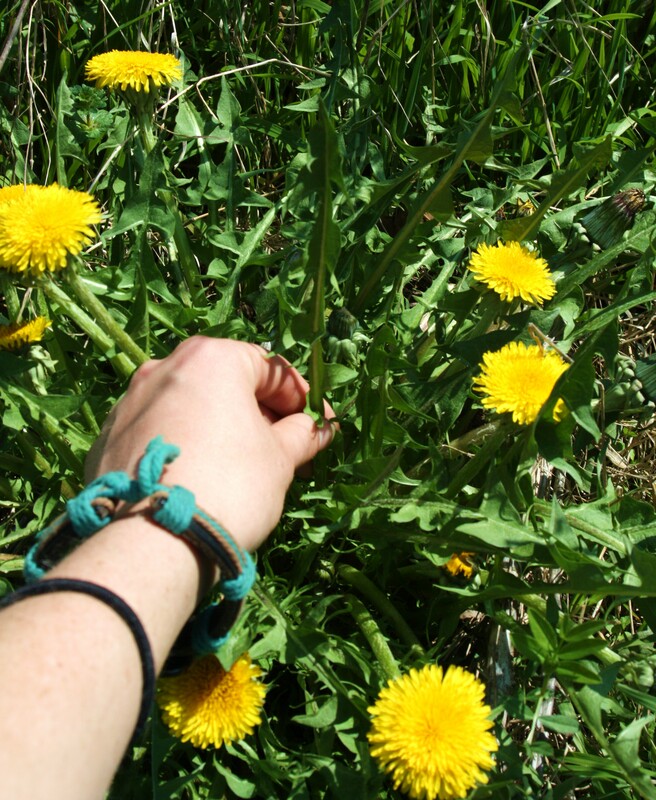 I’m a big fan of edible weeds, too. I love that you included photos from different angles and descriptions of the nutrients. It’s also great that you showed some lookalikes to avoid. Checked this post out and the salad looked delicious! Plus there is a weed on here that I’ve never seen before called Garlic Mustard, everyone check out the link for great photos! I really wish we had this weed down here! I’m glad to have my experience trying to eat plantain as a salad green or pot herb dittoed. All the edible plant books include it, but I just couldn’t get from “chew” to “swallow”! –Thanks for the weed walk! Lol! I agree! It’s bad enough when you have a kid with a ‘boo boo’ and you have to chew it up to place on said wound, cause after that you can never get it all out of your mouth! Great post. I really want to be more educated about edible wild greens. I laugh when I see dandelions in the grocery store. There are millions of them available on the way to town. cleavers / bedstraw is a curse too. I’ve got a 10 acre ‘pasture’ taken over by it. It has a nasty root system that makes it very hard to get rid of. Yep, I recently read that about the Garlic Mustard, I’m glad we don’t have Another invasive species, but as my mom says…”the best way to get rid of it? Eat It!” She was speaking of controlling Bamboo by eating the shoots, but I think the same applies to many invasives. I think another reason invasives exist is because we ourselves create perfect niches and edges for Mother Nature to fill! Great advice! If you can’t beat it, eat it! 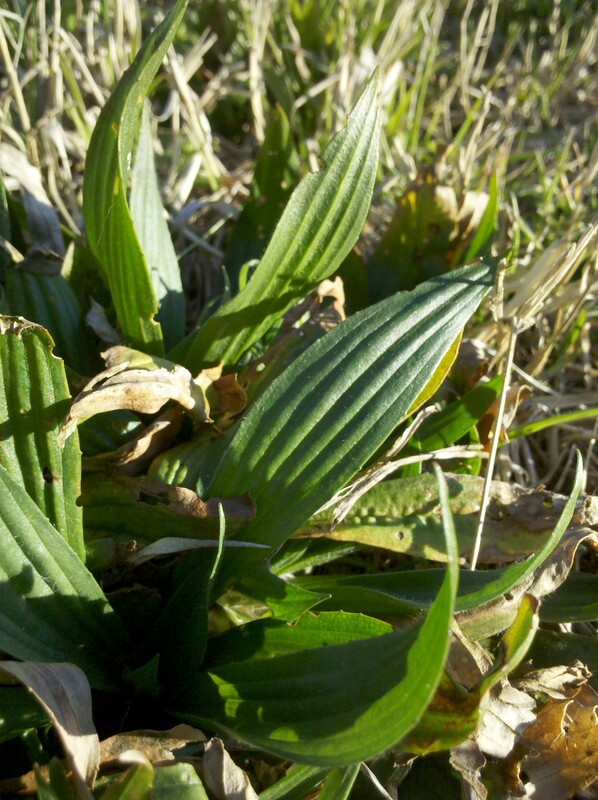 I stumbled onto your blog while trying to identify more “weeds” this Spring on my ~100 yr old property. There is an amazing amount of herbals, flowers and veg all over the place that I am certain were purposefully planted decades ago and still come up when I turn the soil. 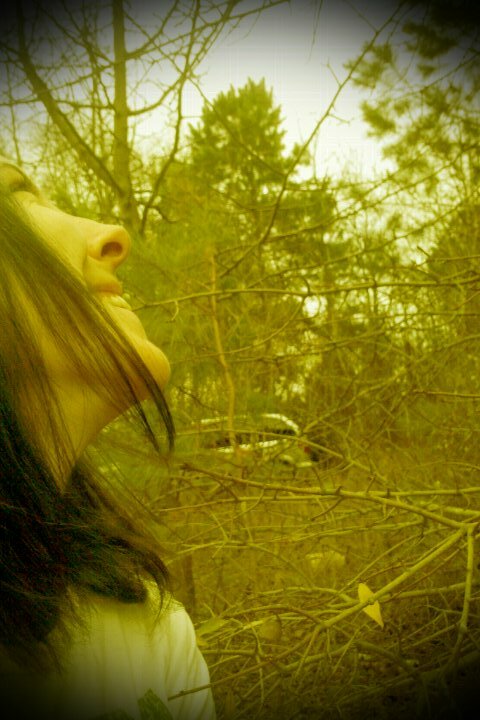 You succeeded at blogging about your homestead in a way I have wanted to for years. I hope you will find time for future posts.